Infusion is a smart chemotherapy app for people who are undergoing chemotherapy. The app allows them to track and monitor side effects, predict future moods and symptoms, and optimize their chemotherapy regimen around special events and key dates. Its predictions are designed to help people who schedule their lives around chemotherapy, as well as people who schedule chemotherapy around their lives. Infusion was created in collaboration with Brian Cohn and Serhan Ulkumen. Over the course of a two-day hackathon, my team set out to develop a data-driven app for cancer patients. During our research phase, we interviewed oncologists, individuals who supported loved ones through chemotherapy, and people who were currently going through chemotherapy to understand the complexities of living with cancer. Some treatment plans focused on curative care, which aims to extend a patient's overall length of life through lasting recovery. Others focused on palliative care, which emphasized providing everyday relief to patients to improve their overall quality of life. While their treatment plans targeted different goals, we noticed a common trend amongst our interviewees: most, if not all, struggled to balance life and chemotherapy. Many people with cancer experience difficulty in committing to future plans, as they aren't sure how their bodies will feel in the future. One interviewee recalled her guilt over reporting symptoms that she didn't know or think were severe enough. "I don't want to inconvenience my doctor if it turns out to be nothing," she said, though an oncologist countered that seemingly small symptoms could eventually result in major damage. Other interviewees experienced difficulties in mentioning their symptoms to their doctors simply because they would forget the duration and severity by the time of their next appointment. In our app, patients report their symptoms according to the Common Terminology Criteria for Adverse Events (CTCAE), the standard classification used by oncologists. 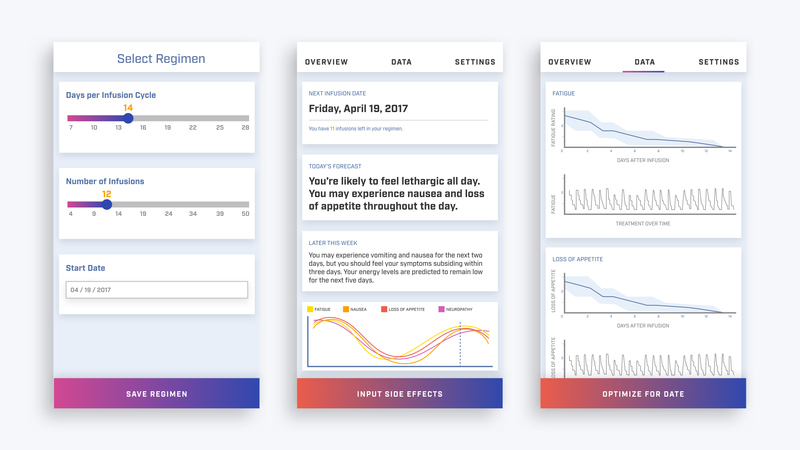 As more data is inputted over time, the app analyzes these self-reported side effects to identify patterns in the cycle and predict future side effects. Infusion encourages dialogue between patients and their doctors by taking the pressure away from self-reporting, as well as providing a more accurate log of symptoms and side effects. In our interviews with clinicians and patient advocates, we discovered that some regimens are flexible—clinicians were able to reschedule infusions to ensure that patients would have enough recovery time to attend events with set dates, like graduations and weddings. Still, patients don't always know or take advantage of this. As a typical Infusion user continues to self-report their side effects mapped against their current regimen, the app optimizes a patient's infusion schedule to position severe side effects away from special events and key dates. 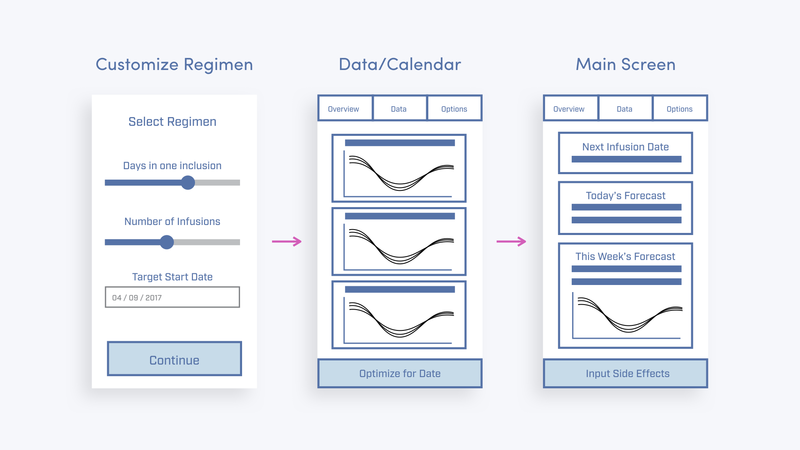 Infusion's algorithm suggests changes to an infusion schedule that would minimize side effects around a given date of the user's choice. They could then take this recommendation, along with a log of their side effects, to discuss with their clinician. "The app helps me reschedule around the days that my side effects are the worst. It has given me back a sense of freedom." Our approach started with the patients. We spoke with patient advocates and combed through reviews of chemotherapy, cancer, and other health-related apps to understand why current apps on the market weren't effective. Many apps functioned as logs for people to record their side effects; others offered helpful educational resources about general care. We differentiated Infusion from already existing apps by taking patient experience into account, and tailored our app to meet their unique lives. We found that inputting data can quickly become a chore when users are nauseous or tired. Additionally, many patients werem't sure whether certain symptoms warranted mention. 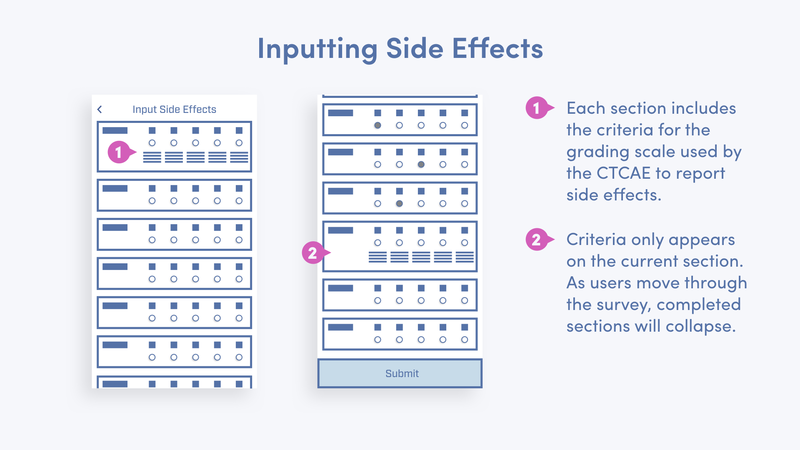 I designed a submission form that targeted both demographics—patients looking to quickly, and seamlessly, record their data, and patients who want to better understand the side effects that come with chemotherapy. We incorporated the CTCAE scale to provide clarity, consistency, and reliability. The descriptions of side effects provide patients with reasonable expectations of treatment toxicity to help them understand common physical problems. Patients grade their side effects using a metric that doctors use and trust. The descriptions collapse as patients input data for each side effect, creating more efficiency and ease. Our interviewees expressed disappointment over canceled plans; some would schedule plans with their friends, only to cancel when they would experience side effects on the day of. The analytical function shows how symptoms like fatigue, loss of appetite, and nausea will change over the course of one cycle, providing immediately useful insights that give patients confidence when making plans for the immediate future.